Free Shipping Included! SunJack 45000mAh Portable Charger External Battery Power Bank (5V/12V/16V/20V) for Laptops, Tablets, Smartphones by SunJack at All Company Mobiles. MPN: SJLPB. Hurry! Limited time offer. Offer valid only while supplies last. STAY POWERED WITH SUNJACK Never have Your laptop, cell phone, tablet run out of battery when you have our long-lasting 45000mAh battery pack. Never have Your laptop, cell phone, tablet run out of battery when you have our long-lasting 45000mAh battery pack. Multi-use All in One Charge Our power bank provides the greatest range of compatibilities for laptops. 11 different connectors are supplied to assure a maximum compatibility with a wide range of popular laptops notebooks. *Please adjust the voltage BEFORE the cable is plugged into the power bank. It does not let you change the voltage when the cable is plugged in. 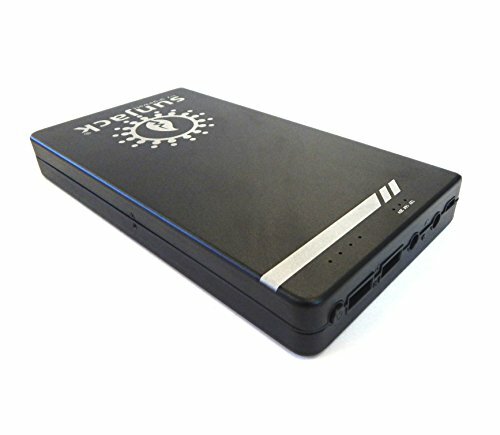 ULTRA HIGH CAPACITY - 45000mAh/166.5Wh charges an iPhone 7 up to 22 times, tablets up to 6 times, and laptops up to 3 times. Fully recharges in 7 hours via DC or 23 hours via USB. All IN ONE FAST CHARGE - 3 Output Ports: One 3A 12V/16V/20V for Laptops and Digital Cameras, One 5V/2.1A and One 5V/1A for most Smart Phones, iPads, Tablets and USB powered devices. Charge multiple devices simultaneously. LIGHTWEIGHT & PORTABLE - Weighs under 2lbs and is slimmer and lighter than most other batteries of a similar size. Includes convenient carrying case. WIDE COMPATIBILITY - DC output provides 20V, 16V, 12V at 3A Max (max power 60W). Comes with 13 different connectors; compatible with most laptops and notebooks: Acer, Asus, BenQ, Compaq, Dell, Fujitsu, HP, IBM, Lenovo, NEC, Samsung, Sony, Toshiba and more. INCLUDES - 1x 45000mah Laptop Power Bank, 1x USB Cable, 1x DC Adapter, 13x Laptop Charge Connector, 1x Carrying Case, 1x Manual, 12 Month Hassle Free Warranty. Macbook connector sold separately.